Don’t get me wrong. I have absolutely no problem with Lake Tahoe’s scenery during the fall. The views are as idyllic as any mountainous locale in the world. Really, I’m not complaining. It’s just that I have this one minor, teeny-weeny, itsy-bitsy gripe. And this is coming from an artist, mind you, so take it with a grain of salt. There’s always one small element missing from Lake Tahoe’s autumn landscape, and that’s the color RED. Sure, some Sierra Nevada flora does transform into a burnt orange or rust color, and there are even a few leaved bushes that yield a reddish hue. However, there’s nothing nearly as brilliant or bountiful as the deciduous forests of my youth growing up in the upper Midwest. I realize that I no longer live in the Midwest but, again, I’m an artist and have developed a fondness for seeing the full spectrum of colors in nature during the fall. There’s just something so definitive about witnessing a green leaf turn red to mark the passage of time and signal the shift from one season to the next. In 2012, I finally found some “red leaves.” Apparently one or two local artists slated for a community-based art project failed to make good on their commitment. So, my name was passed from one person to another as a backup to a backup for the project. Or, so the story goes. I can’t recall the details of how it all manifested, but the bottom line was that I was tasked with decorating a resin-cast sculpture of a Kokanee Salmon. The overall concept was to celebrate the Kokanee Salmon and their fall spawning season. Multiple artists had been selected to decorate multiple sculptures. Once completed, the fish would then be displayed at prominent locations around South Lake Tahoe. When I inherited the project, I had about a week to complete the thing and I knew nothing about Kokanee Salmon. More important than the details about the actual project, however, is what I learned while performing research about the Kokanee Salmon. Each October the Kokanee Salmon return to Taylor creek (map at bottom of article), which is located on the south shore of Lake Tahoe just south of Emerald Bay, to procreate (and subsequently die). Taylor Creek is where they were originally introduced into the Lake Tahoe Basin in the 1940s. As juveniles, or fingerlings, the scent of Taylor Creek was imprinted on their senses. Once a rush of cold water from the creek (usually brought on by fall rains) flows into Lake Tahoe carrying the creek’s scent, many Kokanee Salmon between the ages of 2-4 years old return to spawn. 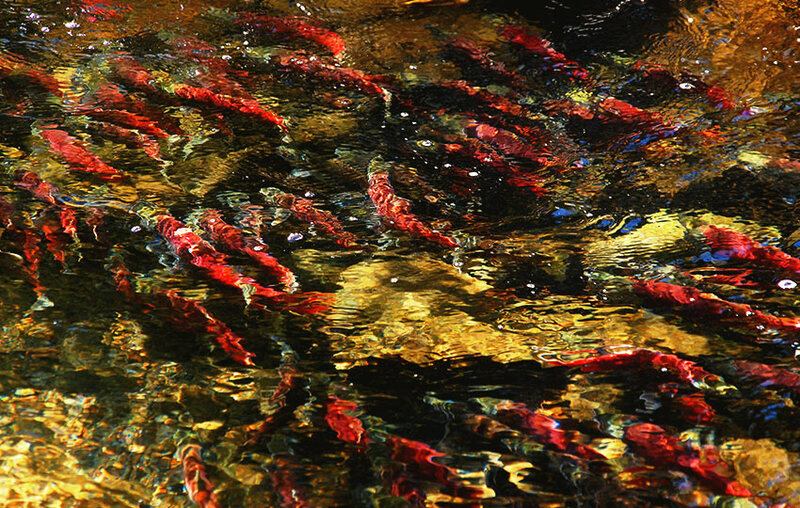 As part of the spawning process, Kokanee Salmon turn a bright red color in order to attract a mate. And I mean bright! Believe me when I say this is a sight that should be witnessed at least once by every visitor to Lake Tahoe during the fall. The sexual preference of the Kokanee (for the color red) has been passed down from Sockeye Salmon, which are of the same evolutionary branch. But whereas Sockeye Salmon swim to the ocean and eat lots of species that contain carotenoid pigments enabling them to turn red, Kokanee Salmon are land-locked and have adapted by processing the pigments with far more efficiency. There’s simply less food in freshwater that contains carotenoid pigments but their preference for the color red has remained, hence their adaptation. In addition to transforming from their natural silver-blue color to red, males develop a green head and fins, a hump back, a protruding jaw (that gives them a serious overbite), and big teeth. Although this Mr. Hyde-like appearance can be a bit startling, their intense red color is arresting. These transformative characteristics are designed to intimidate other male Kokanee so that they (the ones doing the intimidating) have the greatest chances of mating. As the Kokanee make their way up Taylor Creek a female, having selected a mate, begins to make her nesting area called a redd. She establishes this redd by swimming in circles and swishing her tail around a specific area to create a 4-6 inch pocket in the bed of the creek. Once completed, she deposits her eggs and moves on while her selected mate fertilizes the eggs and then guards the site. The female can lay eggs in multiple redds depositing between 400-1200 in total, but each male will remain at their respective site. Only a tiny fraction of the total eggs will end up surviving despite the males’ best efforts to protect them. Within a few days of laying the eggs the female will die, followed shortly thereafter by the males. Although, the males sometimes survive for up to two weeks following the fertilization process. It takes approximately 3-5 months for the surviving eggs to hatch, at which point they’ll lie in wait beneath the gravel for another couple of weeks developing the ability to feed themselves. They then emerge from their hiding places as baby fish called fry. For another month they’ll hang out and eat, gaining the necessary size and strength for their journey to Lake Tahoe. During this transformation from fry to fingerling, they gain their sense of place in Taylor Creek (i.e. they learn its distinct scent). As fingerlings the Kokanee swim out to Lake Tahoe and live for 2-4 years, ultimately to return and continue their cycle of birth and death in Taylor Creek. The tale of the Kokanee Salmon is a grand one providing a microcosmic look at the macrocosmic world. What I find most fascinating is that inherent with their story is one very problematic element, and it’s the same we all face – living in a finite space. Taylor Creek is barely two miles long, and because the creek is so limited in size it’s also limited in resources and it’s constantly at the mercy of nature. Many predators in the vicinity know of this place. Water fowl such as Mergansers will actually eat the whole adult fish, while Mallards and other fish and critters will seek out their eggs. Once the Kokanee spawn and die their rotting carcasses scent the air, so you’ll see a number of scavenging critters show up such as Raccoon and Coyote. And, although Black Bears are known more for eating vegetation, they’ll still wind up congregating around the banks of Taylor Creek. For this last reason, it’s not uncommon for Forest Service personnel to close off the upper portion of Taylor Creek to visitors. Other problematic factors for the Kokanee Salmon that are directly related to the small size of Taylor Creek are when either drought conditions or excessively wet conditions are present, and the presence of Beaver dams. If there’s no rain to fill Taylor Creek and send a cold rush of water carrying its scent into Lake Tahoe, Kokanee can be slow to begin spawning. Even when they do begin to swim upstream they’re faced with a lack of water in which to travel and lay eggs. It’s also been noted that with a lack of water comes a lack of oxygen which adversely affects the development of the eggs. Too much water introduced into Taylor Creek at one time due to flooding conditions, for example, threaten to wash the eggs downstream and either destroy them or leave them unprotected. Beaver dams are not inherently bad things, but they stem the flow of water down Taylor Creek and limit the real estate in which Kokanee can spawn. In response to this situation, Forest Service personnel will often cut notches into the dams to allow water to flow more freely down the creek. On paper it’s a great idea, but in practice it’s challenging. Too small of a notch has no effect. Too big of a notch floods the creek and will wash away the eggs and/or cause extra erosion to the banks of the creek and deposit excessive sediment into Lake Tahoe. If the notch is cut just right (in a bad way), it’ll act as a fire hose and create such a stiff current that the fish will become too exhausted to carry on. Another way in which the Forest Service aids in the survival of the Kokanee Salmon is to place fingerlings in the middle of Lake Tahoe and other mountain lakes so that they may find another location in which to spawn each fall. This approach has yielded some success as evidenced by sightings of Kokanee spawning in the Truckee River, for example. The Kokanee Salmon are a non-native species to Lake Tahoe and clearly require some management in which to enable their survival. So one of my questions was, “Why bother trying to protect and save them?” The fact is, however, that they’re not an invasive species. They’re not trying to take over the place. For reasons beyond their control, they’ve been introduced into the Lake Tahoe ecosystem and are simply trying to survive. And in many respects, they do actually contribute to the overall health (ecologically and economically) of the Lake Tahoe Basin. Not only do they provide food for many native species, they are also an attraction related to outdoor recreation in the form of sport fishing and sightseeing. And, I might add, they’ve added a little red color to the landscape during the fall at Lake Tahoe. Each year around the first week of October, the Taylor Creek Visitor Center (a satellite location of the Forest Service’s Lake Tahoe Basin Management Unit, complete with tours and gift shop) holds its annual celebration of the Kokanee Salmon spawning season called the Kokanee Salmon Festival. It’s worth taking the family to in order to learn more about this cool species of fish.